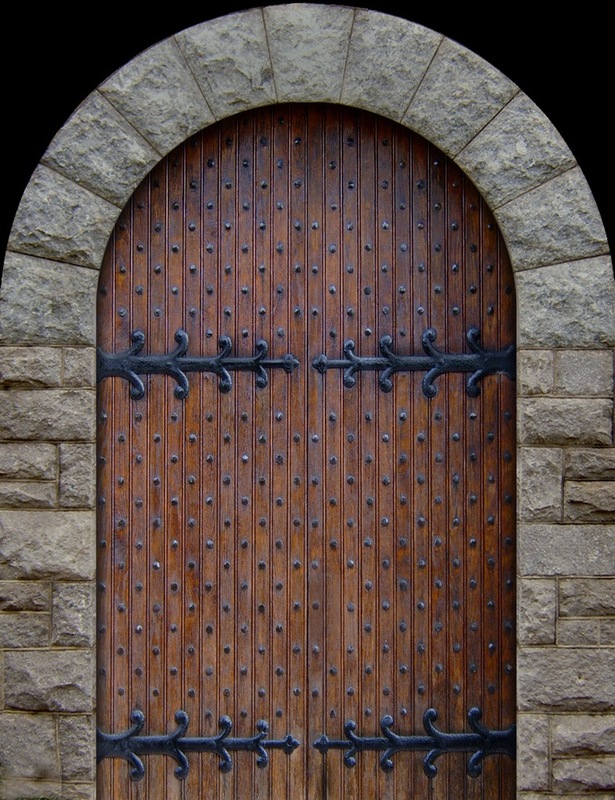 How can a doornail be dead? I've always been fascinated by phrases that we use in everyday language, yet often most of us don't their origin, despite knowing what we mean when we say them. Dead as a doornail: Simply means dead, or of no use whatsoever. Of course, a doornail can't be dead, it's not alive in the first place. :-) But it can become useless. "Look on me well: I have eat no meat these five days; yet, come thou and thy five men, and if I do not leave you all as dead as a doornail, I pray God I may never eat grass more." As early as 1350 this term was in use - to mean absolute uselessness. The Morris Dictionary of Word and Phrase Origins, quotes a researcher who says that if you hammer a nail through a piece of timber and then flatten the end over on the inside so it can’t be removed again (a technique called clinching), [Mmm ... is that where "clinching a deal" comes from? But I digress!] 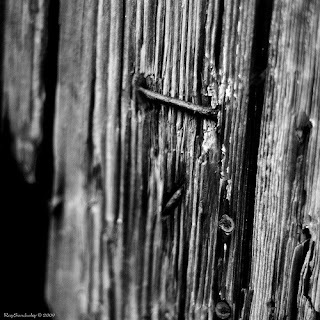 and the nail is said to be dead, because you can’t use it again. 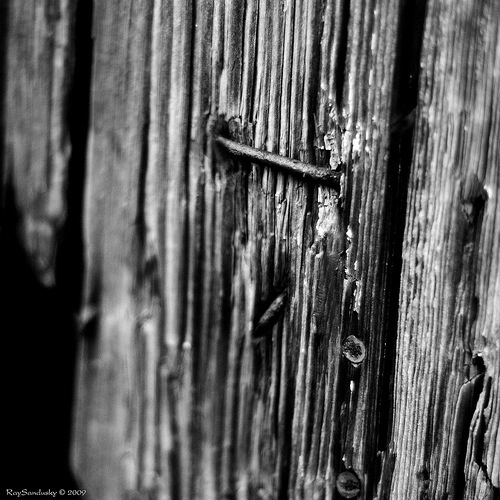 Doornails would very probably have been set in this way to give extra strength to the nail and also to the slated wood in the door in the years before screws were available. So they were "dead" because they’d been clinched and could not be used again. 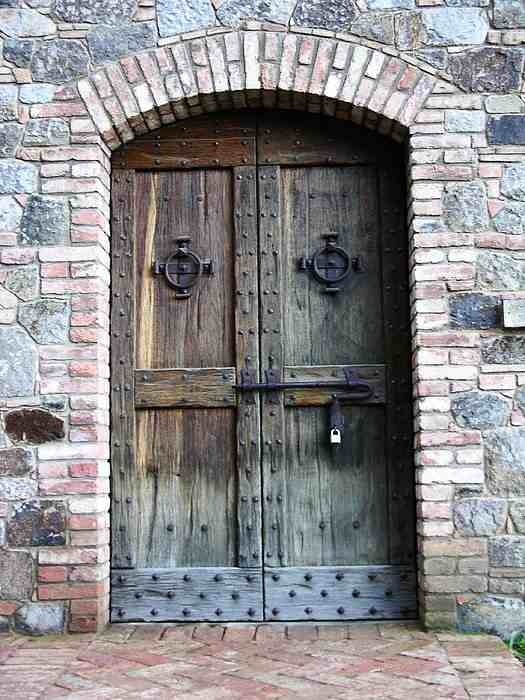 Another source, claims that before electricity, door knockers were used to let people know you had arrived. 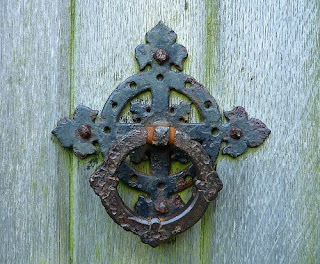 If people were busy in other places in the house, it would often take more than a few hard whacks on the knocker to get their attention. So the nails holding the knocker came in for a lot of punishment and would fall out on the ground. It would be natural to then say the life had been pounded out of the doornails and nothing could be deader. Left-handed compliment: Being a "sinister" that is, left-handed, I always knew this phrase meant an insult pretending to be a compliment. "To be hated cordially, is only a left handed compliment." Herman Melville. You're smarter than you look." You drive very well, for a woman." I didn't recognize you; you look so good." These are all left-handed compliments. In medieval times, beauty and charm were not limited to the upper classes, and since the beginning of civilization high-born men had been falling in love with women from lower classes. This ritual was distinguished from the usual one, by the fact that the groom gave his bride his left hand rather than his right during the ceremony. To the casual observer it might have seemed as usual, but a left handed marriage - called a morganatic (left handed) marriage - was, in fact, a marriage in name only. Neither the new wife or any children from her womb could ever gain her "husband's" rank or his property. But it had made a lasting impression: It resulted in the view that an insult which masquerades as praise is called a left-handed compliment. I studied this painting in art school. 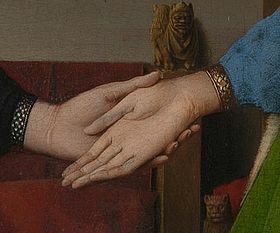 It is by Jan Van Eyke painted in 1434 and it appears to me (and to some actual experts ;-) to be a left handed marriage. 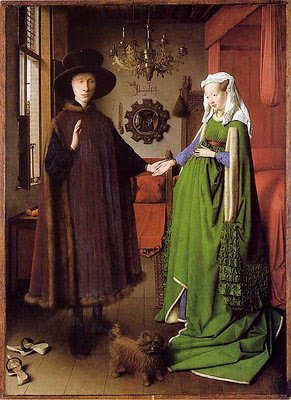 It is called "The Arnolfini Painting" or sometimes "Giovanni Arnolfini and his Wife." "I look upon you, sir, as a man who has placed himself beyond the pale of society, by his most audacious, disgraceful, and abominable public conduct. Mr Pott to Mr Slurk in The Pickwick Papers by Charles Dickens, 1837. But what is a pale, or what is going beyond a pale? Just to point this out, the word pale in this phrase or idiom has nothing to do with a pail, or with a lighter tone of a colour. So where does the word pale fit into it? The word pale in this phrase actually refers to a stake in the ground or a row of stakes and comes from the Latin word palus. 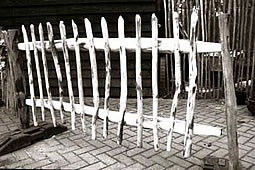 A row of pales becomes a barrier of stakes; a palisade or a fence. (Does this have anything to do with the word impaled - as in "He took his sharpened stick and impaled him with it."? Digressing again....) Some believe the word "pole" comes from pale also. This word pale in this context has been around in England since the 14th century but by the 15th century, pale took on a deeper political meaning, including a defence, a safeguard, a barrier, an enclosure, or a limit beyond which it was not permissible to go. The term pale was used to describe other enclosures of territory inside countries controlled by invaders. For example, the English pale in France in the fourteenth century was Calais, the last English possession in that country. Then there was the Russian Pale, between 1791 and the Revolution of 1917, when there were specified areas in which Russian Jews were required to live. 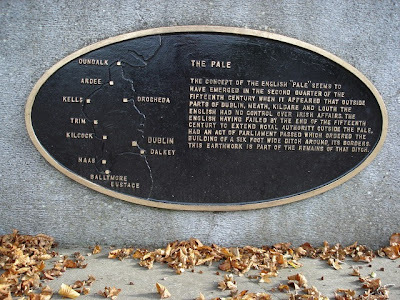 In Ireland, the word pale also appears to mean a deep ditch (which was never finished and I'm not sure if it has a row of pales that went on for miles - I doubt it!) that was to be a demarcation line separating those areas of Ireland taken over by the English. 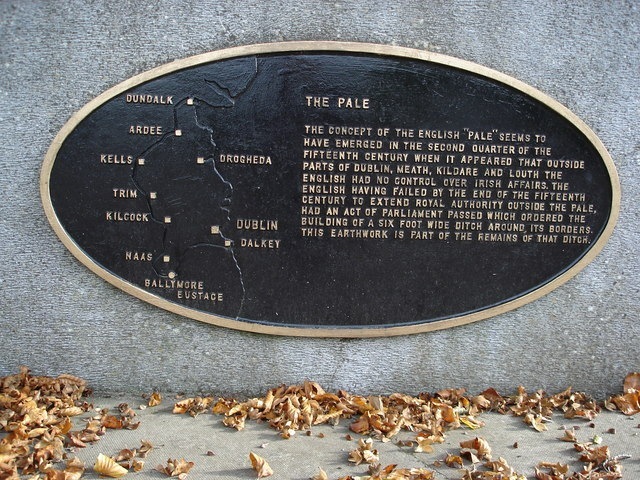 For an Irish person (from outside the pale) to attempt to go beyond The Pale and enter the area controlled by the English was forbidden. I find the plaque above rather confusing to read. It sounds as if Dublin and the other counties mentioned were not controlled by the British. But that area was, in fact, the part of the country which England directly controlled — it boundaries changed now and again, but it was always an area of several counties centred around Dublin - including County Louth. My Irish great-grandfather was born in Louth, Ireland in the early 1800's. (Only of interest to me, of course!) The first mention of the Irish Pale is in a document of 1446–7. You're welcome. Writing blogs is always fun and this one was a lot of that. I did make a scattering of typos and missed words, so I've fixed those. Honestly Susan, I read these things over and over again and when they are "published" I catch even more errors! I need a blog editor! This is so interesting, Margaret. I had to share it on my facebook page. I love being educated in this way - the photos are great. I'm sure this will stick in my mind (unlike so much else!). Makes me wonder about all the other phrases I use without thinking ... like two sheets to the wind (not that I ever drink, of course). Thanks for the fun post! p.s. I never think about typos. Doesn't everyone do it? Thanks, Jo. It's amazing how many common phrases come from sailing ships! I will look up the "sheets to the wind" phrase and put it in the next set of phrases. Also, if you received more than one reply from me (all slightly different!) it was because my wireless kept cutting me off just as I posted them and I lost them somehow. Grrrr. I need a new computer or a new wireless set-up. Or a nap! Actually, my son informs me it's 'three sheets to the wind'. Naturally I wouldn't know that. Looking forward to the results of your research on this one! I found naps solve most everything. Heh, heh. I found out what "sheets" are but you are not allowed to look. I'm working on my next installment. I love learning these types of origins! Hadn't considered the dead as a doornail before at all.